Given the recent announcement that Intel will support the launch of new high-performance low-cost Google Chrome devices, perhaps Chromebooks and associated cloud services will become the new high-growth segment of the consumer electronics industry. Meanwhile, sales of media tablets have apparently peaked. Worldwide media tablet plus 2-in-1 device shipments slipped to 50.4 million units in the first calendar quarter of 2014 (1Q14) according to the latest market study by International Data Corporation (IDC). The total represents a sequential decline of -35.7 percent from the high-volume holiday quarter and just 3.9 percent growth over the same period a year ago. The slowdown was felt across all tablet operating systems and screen sizes and likely points to an even more challenging year ahead for the product category. 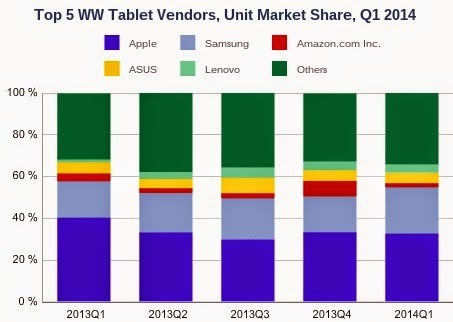 "The rise of large-screen phones and consumers who are holding on to their existing tablets for ever longer periods of time were both contributing factors to a weaker-than-anticipated quarter for tablets and 2-in-1s," said Tom Mainelli, Vice President at IDC. In addition, commercial growth has not been robust enough to offset the slowing of consumer shipments. Apple maintained its lead in the worldwide tablet plus 2-in-1 market, shipping 16.4 million units. That's down from 26.0 million units in the previous quarter and well below its total of 19.5 million units in the first quarter of 2013. Despite the contraction, the company saw its share of the market slip to 32.5 percent, down from the previous quarter's share of 33.2 percent. Samsung once again grew its worldwide share, increasing from 17.2 percent last quarter to 22.3 percent this quarter. Samsung continues to work aggressively with carriers to drive Android tablet shipments through attractively priced smartphone bundles. Rounding out the top five were ASUS (5 percent), Lenovo (4.1 percent), and Amazon (1.9 percent). In summary, with roughly two-thirds share, Android continues to dominate the market.